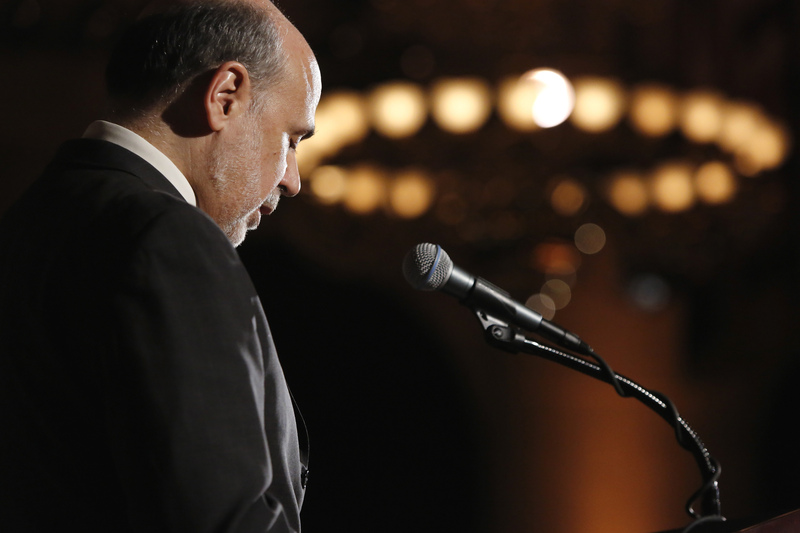 Ben Bernanke is following a well-worn path to the private sector. The Federal Reserve chief turned economics blogger is going to advise Ken Griffin’s $25 billion hedge fund firm, Citadel Investment Group. Critics may cry foul. But even former public servants are entitled to work for pay. At least Bernanke waited more than a year after handing the Fed chair to Janet Yellen in February 2014. He has given paid speeches, each worth at least $200,000, according to news reports – matching his annual pay at the Fed. But he hasn’t done anything as crass as the dinner his predecessor attended within a week or so of leaving office in early 2006. At that event, hosted by none other than Lehman Brothers, Alan Greenspan briefed the bank’s top hedge fund clients. Greenspan went on to advise Deutsche Bank as well as John Paulson’s hedge fund firm. Bernanke told the New York Times he is eschewing bank work, because the Fed regulates the companies. Yet politically, there’s already a bad smell hanging over the revolving door between the public sector and the world of finance. And skeptics will detect in Bernanke’s move further evidence that the Fed, a central piece of the regulatory apparatus in the United States, has been captured by the financial industry and its super-rich elite: people like Griffin. After all, Citadel struggled badly during the financial crisis, forcing Griffin to make the case for the firm’s survival in a highly unusual conference call in October 2008, right after Lehman collapsed. Bernanke’s Fed may not have helped the firm directly, but the central bank’s actions spared the entire industry from far worse. Its rapid trading style also means that Citadel is, by volume, one of the biggest participants in U.S. equity markets. That makes it significant in some ways to the financial stability the Fed aims to promote. Bernanke will presumably impart his economics expertise as well his Fed experience, not lobby for Griffin’s firm. And he won’t be taking any performance-related pay. Short of some kind of idealistic self-deprivation, it’s hard to fault his choice. That won’t, however, stop detractors from doing so. Should Citadel have put its head over the parapet? Ben Bernanke, the former chairman of the U.S. Federal Reserve, has agreed to become a senior adviser to Citadel Investment Group, a $25 billion hedge fund founded by billionaire investor Kenneth Griffin, the New York Times reported on April 16. Bernanke told the newspaper that he was sensitive to public anxiety about the “revolving door” between Wall Street and Washington. He said he chose Citadel, in part, because the fund is not regulated by the Fed, and his role would not involve any lobbying. Bernanke added that he had declined offers from banks.